Dr Ancel Keys is one person that the popular diet commentators love to demonise – a common label is “infamous”. Keys did not lie, “cherry-pick” his data or manipulate results to confirm his hypothesis. There is a large body of evidence both before and after Keys’ initial work regarding the role of fats in heart disease. Unfortunately, the misinformation that is being propagated contributes to the increasing health crisis that these commentators contend that they are preventing. Every preventable death is someone’s husband, wife, father, mother, friend and acquaintance whose life is needlessly terminated prematurely and The Big Fat Surprise continues to propagate this misinformation. Unaware of the flimsy scientific scaffolding upon which their dietary guidelines rest, Americans have dutifully attempted to follow them. Since the 1970s, we have successfully increased our fruits and vegetables by 17 percent, our grains by 29 percent, and reduced the amount of fat we eat from 43 percent to 33 percent of calories or less. Teicholz neglects to inform us is that for the period 1970 – 2000, the consumption of total added fats (up 40%), dairy products (up 8%), cheese (up 107%), low fat milk (up 79%), all meat products (up 10%), poultry (up 89%) and fish (up 22%) increased. All of these food products, even low fat milk, are high fat foods. 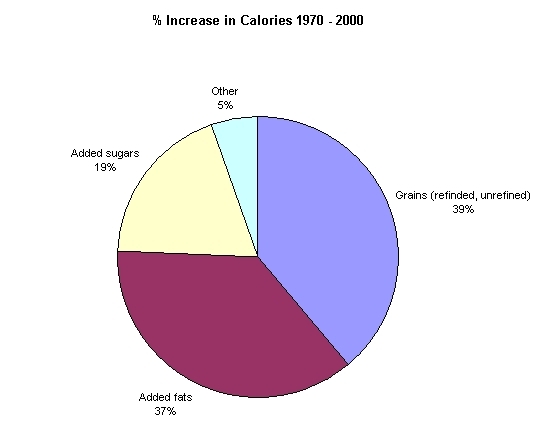 The same publication shows the increase in different food groups from the 1950s. Note that fats have 9 Cal/g whilst carbohydrates and protein have 4 Cal/g. The claim that the American people have been eating a “low-fat, near vegetarian diet for the last half-century” is absurd. Beef consumption may have reduced 20% but all meats have risen 10% and poultry 89%. 33% of calories from fat is NOT a low-fat diet. It is reasonable to suggest that cholesterol and heart disease research originated with Nikolaj Anitschkow. This is how Nina Teicholz reports the situation in the early part of the 20th century. In 1913, the Russian pathologist Nikolaj Anitschkow reported that he could induce atherosclerotic-type lesions in rabbits by feeding them huge amounts of cholesterol. This experiment became quite famous and was widely replicated on all sorts of animals, including cats, sheep, cattle, and horses, leading to the widespread view that cholesterol in the diet—such as one finds in eggs, red meat, and shellfish—must cause atherosclerosis. This research did NOT become famous. It was neglected for over 30 years. It was not replicated on cats (or rats or dogs) for decades because thyroid function in carnivores converts cholesterol into bile salts and does not raise serum cholesterol levels. Dietary cholesterol does increase serum cholesterol in humans that have comparative low initial serum cholesterol levels. “Normal” serum cholesterol levels are much higher in humans than other species. The hypothesis that saturated fat causes heart disease was developed in the early 1950s by Ancel Benjamin Keys. Keys was certainly not the first person to link diet and fats to heart disease. Cornelius de Langen worked as a doctor in the Dutch East Indies from 1916-1922, (yes 1916). He linked diet, serum cholesterol and heart disease by comparing diets of native Javanese and Europeans. He also noted low cholesterol content of bile and the rarity of gallstone in Javanese. Lester Morrison in 1946 also linked diet, cholesterol and heart disease before Keys. Dr John Gofman, a nuclear physicist, was a leading pioneer researcher in the field of lipoproteins who was familiar with Anitschkow’s work. His work showed that both cholesterol and low-density lipoproteins were both indicators of coronary heart disease risk. This work and other evidence convinced Gofman that blood cholesterol, and the dietary determinants of blood cholesterol, was centrally important in atherosclerosis. His wife, Dr. Helen F. Gofman co-authored a low-fat, low-cholesterol diet book  that was published in 1951 – prior to Keys’ paper. John Gofman wrote the preface for the book. Teicholz cites Norman Joliffe’s 1957 study, The Anti-Coronary Club, as further evidence of the failure of a low-fat diet to arrest heart disease. A decade into the trial, however, investigators discovered that 26 members of Jolliffe’s diet club had died, compared with only six men from the control group. Eight members of the club had died of heart attacks. However, according to the paper The Anti-Coronary Club – A Dietary Approach To The Prevention of Coronary Heart Disease – A Seven-Year Report, states that the incidence of new cases in the Active Group was 339 compared with 980 per 100,000 on the Control Group. The same report states that there was 8 new events (note that it is 8 new events, not deaths) for the Active Group and 12 new events for the Control Group. Despite Teicholz’s claims, the number of deaths was not reported. The Active Group had a much higher level of risk factors than the control group. Critics have pointed out that Dr. Keys violated several basic scientific norms in his [Seven Countries] Study. For one, he didn’t choose countries randomly but instead selected only those likely to prove his beliefs, including Yugoslavia, Finland and Italy. Excluded were France, land of the famously healthy omelet eater, as well as other countries where people consumed a lot of fat yet didn’t suffer from high rates of heart disease, such as Switzerland, Sweden and West Germany. Teicholz does not state which critics. Keys does give reasons why he choose the countries. Note that Keys and his colleagues were not studying countries. Paul Dudley White, the esteemed cardiologist, was involved in the selection of the regions. They selected 16 different, contrasting regions in 7 countries. There are wide regional variations in the diets of France with 8 distinct dietary regions. Similarly, there are wide variations in diet in rural and coastal areas, with Finland being particularly notable. According to a paper in the Dialogues of Medicine – Vol 13 No 3 2008, the French paradox is indeed a myth. As it turns out, Dr. Keys visited Crete during an unrepresentative period of extreme hardship after World War II. There were 3 rounds of surveys in Crete in 1960, 1965 and 1970 which were many years (decades) after the end of World War II. Keys did not work isolation. He worked with teams that included native speaking researchers. For each of the heart disease groupings the strongest association is with the total number of calories from animal protein. Their paper also revealed positive correlations between heart disease and calories consumed, fat consumption, animal fat consumption, animal protein consumption which is ignored by Teicholz. The paper also revealed negative correlations with heart disease and carbohydrate consumption, vegetable protein consumption, vegetable fat consumption. Teicholz uses both the Inuit and Masai as examples of healthy populations that thrive on a high fat diet. Inuit are far from being a healthy population They suffered from osteoporosis, a very high rate of stroke, kidney disease, parasites including toxoplasma, atherosclerosis and glucose intolerance. Parasitic infections lower blood cholesterol. In 1906, Vilhjalmur Stefansson lived with the Inuit in northern Canada, living and eating with his hosts. A Time magazine article from March 31 1930, Medicine: All-Meat Controversy describes Stefansson and a colleague Karsten Anderson consuming a flesh only diet for a year. This experiment was funded partly by Institute of American Meat Packers. They suffered constipation, their muscles were “soft and flabby” and suffered from glucose intolerance and acetonuria. Their urine acidity increased. Anderson suffered from glycosuria. However, the researchers, sponsored by the meat industry, reported “no ill-effects”. Measurements of the aorta showed extensive atherosclerosis with lipid infiltration and fibrous changes but very few complicated lesions. The coronary arteries showed intimal thickening by atherosclerosis which equaled that of old U.S. men. Masai also have a very low energy intake in the foods, are active and suffer from parasitic infections – all which contribute to low serum cholesterol and lower the risk of heart disease. In chapter 2, there is an incorrect diagram of a fatty acid with a caption A Fatty Acid Is a Chain of Carbon Atoms Surrounded by Hydrogen Atoms. Two of the carbon atoms only have 3 hydrogen atoms (high school chemistry tells as that there should be 4 hydrogen atoms). It is also missing the carboxyl group at one end that contains two oxygen atoms. The focus on any one component of a diet such as fats, saturated fats or sugars is misleading. Ancel Keys coined the name and introduced the concept of Mediterranean diet In 1975, Ancel Keys and his wife Margaret published the book How to Eat Well and Stay Well the Mediterranean Way (New York, NY: Doubleday & Co; 1975) based on the results of his studies. This diet was based on the diets of Greece, southern Italy and the Mediterranean coasts of France and Spain in the 1960s. The heart of what we now consider the Mediterranean diet is mainly vegetarian: pasta in many forms, leaves sprinkled with olive oil, all kinds of vegetables in season, and often cheese, all finished off with fruit, and frequently washed down with wine. Ancel Keys and his wife Margaret lived a village in southern Italy for 28 years. Keys lived to be 100 years old and his wife 97. A Mediterranean diet or a Whole Food Plant-Based diet as practiced by societies that are longest lived and healthiest is, by it’s nature, low in fats, saturated fats, animal protein and high in carbohydrate, antioxidants, dietary fibre, vitamins, minerals and the many other micro nutrients that are essential for our well being. Steinberg, D. (2007) The Cholesterol Wars: The Skeptics vs. the Preponderance of Evidence. San Diego, CA: Academic Press. McClellan, W. S. & Bois, F. D. (1929) Prolonged Meat Diets with a Study Function and Ketosis. Clinical Calorimetry. Teicholz, N. (2015) The Big Fat Surprise. Simon & Schuster. Mann, G. V. et al. (1972) Atherosclerosis in the Masai. American Journal of Epidemiology. 95 (1), 26–37. Keys, A. (1995) Mediterranean diet and public health : personal reflections. American Journal of Clinical Nutrition. 613–5.